The LANEW3 H Series offers 3 watts of output power from a 0.86 x 0.36 x 0.44 inch package without derating up to 71ºC. The LANEW3 H Series has a 2:1 wide input voltage range of 4.5-9, 9-18, 18-36 and 36-75VDC, it features 3000VDC I/O isolation, remote on/off, and short-circuit protection. All models are ideally suited for telecommunications, mobile telecom, test equipment, and industrial applications. Notes: 1. MTBF: BELLCORE TR-NWT-000332. 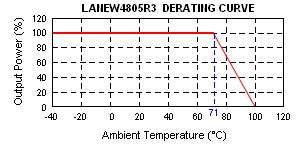 Case: 50% Stress, Temperature at 40°C. MIL-HDBK-217F Notice2 @ Ta = 25°C, Full Load (Ground fixed and controlled environment). 2. The LANEW3 "H" series meets EN55022 Class A with an external L-C filter before the input pins on the converter. See detailed specs for recommended configurations. 3. 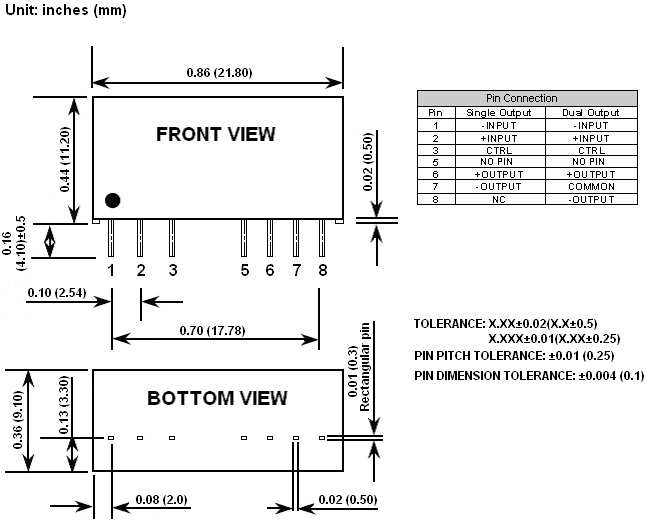 The external input filter capacitor is required if the module has to meet EN61000-4-4, EN61000-4-5. The filter capacitor suggested is Nippon chemi-con KY series, 220µF/100V, ESR 48MΩ. 4. For 1600VDC input/output isolation see the LANEW3 Series.